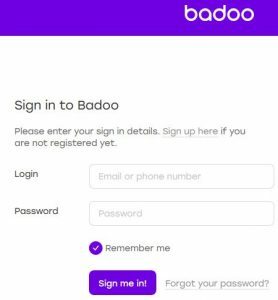 There may be several reasons that you are being unable to access your Badoo login account and you could have forgotten your password of Badoo or use after a few months to find your account automatically deactivated. One of the most common reasons for lost accounts is that users forget their passwords.In case if same had happened to you, dont worry you can recover your account hassle free.Mentioned below are the steps involved to Reset Badoo Password. At first you need to go to the Sign In page for Badoo.com or use badoo.com for the sign in page. Find the ‘Forgot your password’ link which is below to the green ‘Sign Me In’ button. Now you need to click on the link and follow the instructions on the screen to reset your password. You will have to enter the email address you signed up with and a Captcha code at this point. The site will send you an email to your address with a new link in order to reset your password of badoo. If in case, you don’t see the link in your email inbox you need to check your Junk or Spam folder where even legitimate emails often end up. You need to open the link of resetting the password of badoo where you need to write a new password and then you need to click in the submit button. Finally you had reset your password of Badoo. Now you can sign in with your new password and you are done. At first you need to go to your inbox and find the email confirmation that was sent to you by the Badoo team when you had deleted your account. In that email, you will be able to find a link that the team has sent you for just such a situation. Click in the link and you will be able to reset your password and recover your account. However, you should have an idea about that link as it is valid only for thirty days after account deletion. If in case your account has been longer than you had deleted your account, you will have to sign up for a new profile which says the Badoo team on their website. In case if you have forgotten both the email ID and the password that you used to sign up for your profile then you should contact the team directly. You can find the feedback form at the address badoo.com/en/feedback/ link where you can then begin to get your account back and get back on the exciting social world of Badoo once more. This is how you can Reset Badoo Password.Hope this was helpful.Enjoy Badoo!! This entry was posted in Account Reset Password and tagged Badoo, badoo forgot password, How to Recover Deleted Badoo Acoount, how to reset badoo password, reactivate a Deleted Badoo.com Account, recover badoo account, Recover Badoo Password, Reset Badoo Login Password, Reset Badoo Password, Reset Badoo.com Login Password, reset my badoo password, reset password on badoo on April 27, 2018 by jcgbyHvNvn.